Augustus the Strong, Elector of Saxony and King of Poland (reg. 1694 – 1733), had a problem. He had spent most of his treasury collecting and importing Asian porcelain, at the time almost as costly as gold. In 1701, he imprisoned scientist Johann Friedrich Böttger (1682 – 1719), who claimed to be able to turn base metals into gold, in an attempt to rectify his financial situation. Although Böttger failed to make gold, he eventually made something just as valuable to Augustus – porcelain. The Meissen Porcelain Manufactory opened in 1710 in the German city of the same name. As the first European firm to successfully manufacture hard-paste porcelain, it closely guarded its secret recipes and formulas. 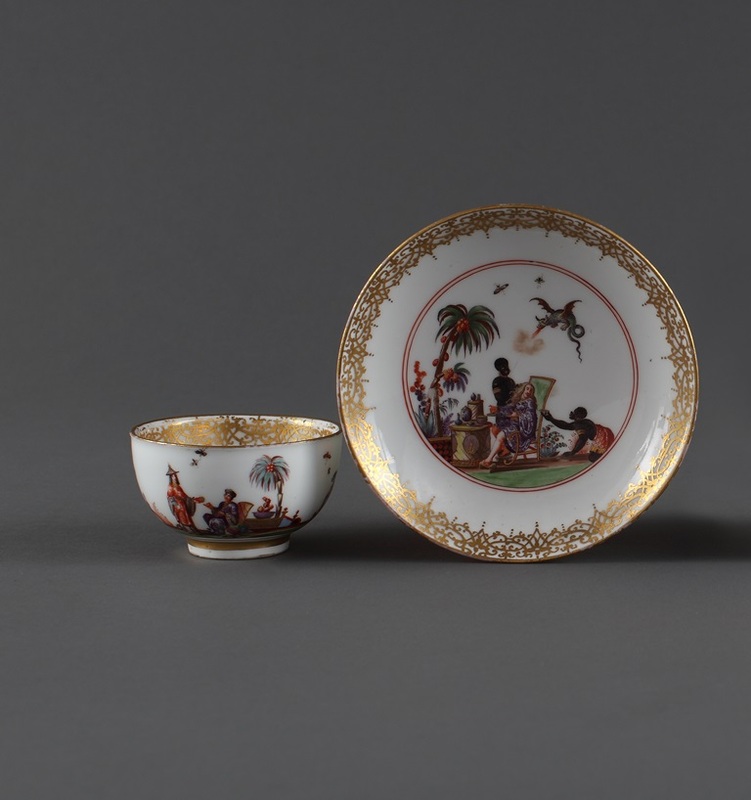 This Tea Bowl and Saucer was painted by Johann Gregorius Höroldt, who used illustrated travel books to create his fanciful interpretations of life in China, complete with magnificently-dressed men and women as well as exotic plants and animals, like the flying dragon and water buffalo seen on the saucer and bowl, respectively. The saucer also features a likeness of Augustus the Strong being attended to by two Moorish servants.